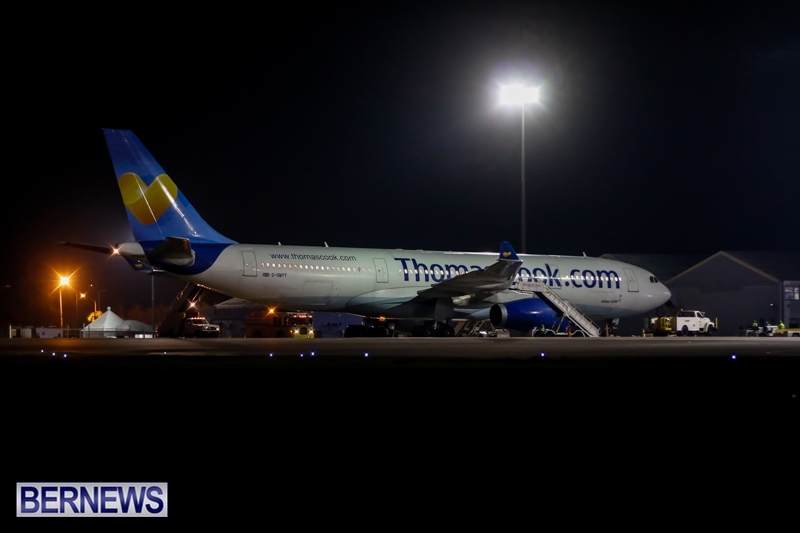 [Updated] Emergency services gathered at the LF Wade International Airport tonight [Aug 19] after Thomas Cook Flight 135 diverted to the island for a sick passenger, landing at approximately 9.30pm. The flight which departed from the Frank Pais International Airport in Holguin, Cuba was on route to London Gatwick Airport in England, when at approximately 8.45pm the pilot made the decision to divert to disembark the passenger. The Bermuda Fire and Rescue Service and hospital staff were on hand at the main terminal when the plane came to a stop. The sick passenger was transferred to an awaiting ambulance and transported to King Edward Memorial Hospital for treatment. After taking on fuel, the flight continued on to its original destination, departing Bermuda at approximately 11.20pm. Update August 20: A police spokesperson said, “At 8.43pm on Tuesday, August 19, police received a report of an Airbus 330, Thomas Cook Airlines Flight number TCX135 from Cuba to Gatwick, UK, diverting here regarding a 14-year-old female who reportedly had difficulty breathing and abdominal pains. .how bout cholera?…….I am being led to believe there is an issue with cholera just about now….could this be it? Just because it pops into your brain does not mean it has to come out of your mouth!!! I hope Bermuda has something in place with Ebola being so dangerous!!!! I hope this passenger is ok and makes a quick recovery. With the issue with Ebola going on is the Health Department keeping a close eye on these type of situations? Everybody seems to be “en-route” to somewhere else lately!!! I guess they checked the hotel and restaurant rates…. Then looked at what little entertainment was available and made a “logical decision” to go somewhere cheaper with more-to-do!!! Wouldn’t you do the same – under the circumstances? ?